Alexandria Gilbert is a botanical watercolor artist who loves to create vivid, joyful paintings. A native of small-town upstate New York, Alex was fortunate enough to spend a number of years in Europe, where she attained a law degree, traveled hither and yon, and spent many happy hours in world-famous art museums. Inspired by these experiences to paint, she has since had several successful shows, enjoys teaching creative workshops, loves to be involved in the local arts community and likes nothing better than to turn on an audio book and get busy painting. You can get to know Alex personally by visiting her website at www.alexsgardenstudio.com or check out her Instagram page @alexsgarden. 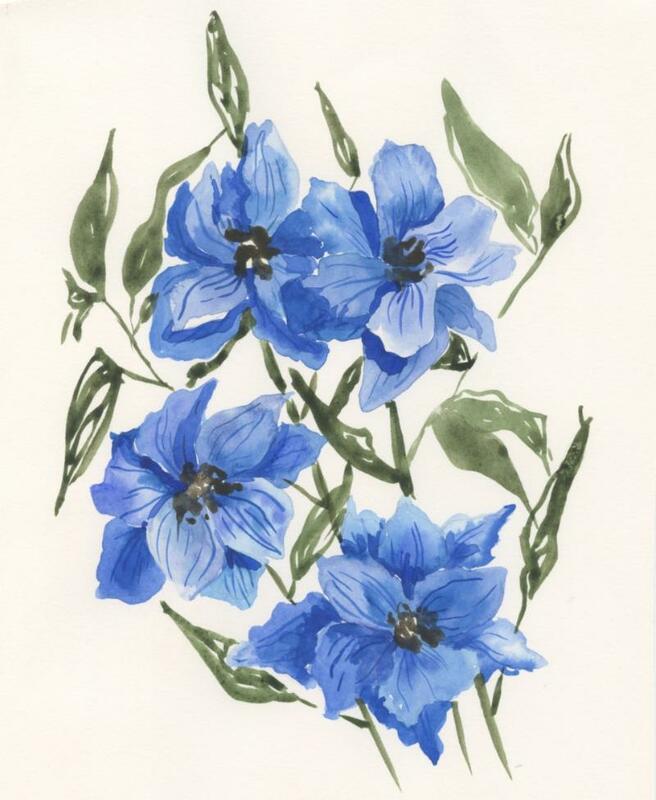 This collection of floral watercolor paintings was inspired by her dear friend Jane, who has a truly splendid garden. Using Jane’s garden as a reference, Alex created this collection entitled Impressions of Spring intending to capture the fleeting, sweet early days of springtime with fluid, loose strokes of vivid color. Each month, the Library displays works by local artists in the main lobby. A biography of the artist and a list of the works, many of which are for sale, can be found at the circulation desk. Thanks to board member Terry Wise for curating this revolving art gallery. See the calendar for future artist showings. Shows run for one calendar month. Artist is responsible for hanging and taking down artwork, with help from the art curator. If artist desires an opening reception s/he will be responsible for all related costs and set up. Receptions may be held on Tuesday or Friday evenings from 5-7:00 p.m.
Library will post notice of the show on its website, Facebook, and enewsletter. All other promotion is the responsibility of the artist. Sales are to be handled by the artist. A 20 percent donation to the Stockbridge Library is expected on any sales generated by the show. For a printable set of these guidelines, please click HERE.